The twelfth-largest brewery in the country, Deschutes Brewery asked us to put their 25 years of tradition into words. "Worth Sharing" embodies not just what's in the bottle, but also the moments you have around them. 400 feet of bar, 60 taps. 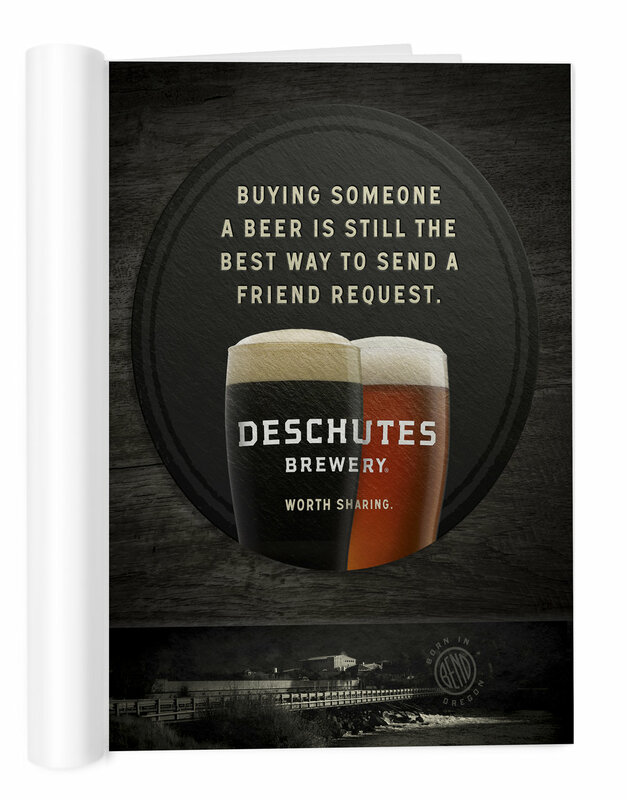 Deschutes wanted everyone to feel like they had a seat at their Pub. So we made a pub that could fit everyone . The bar toured the country, breaking records for most kegs tapped, and most money donated, in a single day. The only thing better than a “like” is an unofficial “like”. No one has proved this more for Deschutes Brewery than Jimmy Barr, who's managed the Unofficial Black Butte Porter Facebook page for the last five years. To repay the favor, Deschutes Brewery transformed their own Facebook into the “Unofficial Jimmy Barr Fan Page”. For one week, promoted posts thanked Jimmy for his years of support. The brewery even packaged a limited-release “Unofficial Black Butte Porter” to show their appreciation.